Gunpla is most enjoyable when you pick one that meshes with your skill level. Fortunately, it’s easy to find the perfect model for you since Gunpla categorization is something of a science. Bandai, the company that manufactures all Gunpla models, categorizes them in two ways—by grade and by scale. Super Deformed EX Standard: Launched in 2015, these are a version of SD kits that have more poseability and slightly more realistic proportions. Their accessories are large enough that they can be used interchangeably with High Grade models. Reborn-One Hundred: Announced in 2014, this brand new Gunpla grade also has its scale in the name. Known as RE for short, this grade has the level of complexity of a High Grade made easier by the fact that all the parts are larger, leading to a larger scale finished product. 1/100: The next size up. I’ve got my eye on a few models that come in this size. Master Grade models come in this scale, as do Reborn-One Hundreds. 1/48: This is commonly known as Mega Scale. It’s huge (about the size of a housecat) but there are only a select few available kits, so you don’t see it very often. Nonscale: Anything that isn’t scaled in relation to the specifications from the show. SD Gunpla almost always fit into this categorization. So quiz yourself: Which of the Gundams pictured was the hardest to build? It was NOT Victory Gundam (High Grade 1/60). 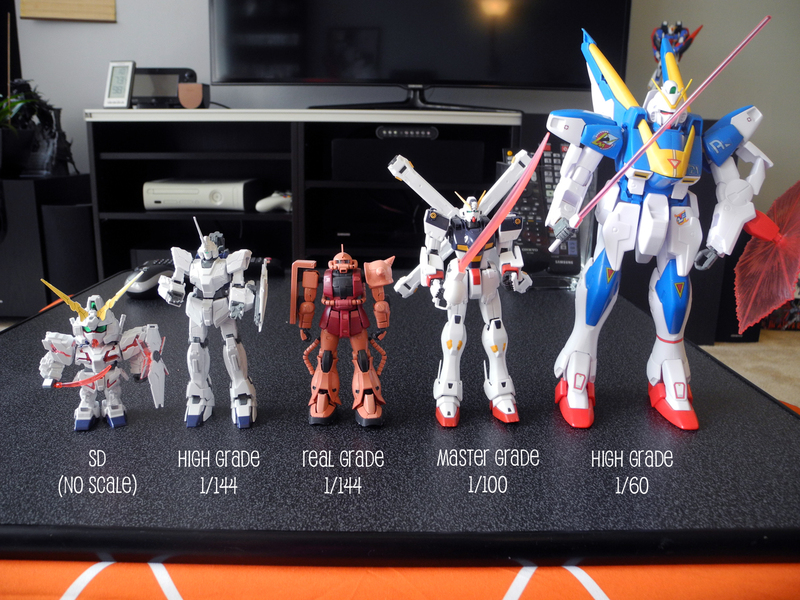 It’s easy to make this misconception because the hardest Gundam models on the market—Perfect Grades—are almost always 1/60 scale. But as we know now, scale has nothing to do with difficulty. The grade will always determine how many pieces make up a model, and therefore how hard it is to build. The real toughie of the bunch is Crossbone Gundam (Master Grade 1/100). As a Master Grade, it has the most parts, and these parts have been manufactured with the finest quality. For example? Crossbone has working fingers that can grasp weapons just like a real hand. Note also that Crossbone is smaller than many Master Grades might be, because in the Crossbone Gundam manga, it was an especially small Gundam. Below, I’ve lined up several High Grade Gunpla, 1/144 scale. Each of these is the exact same scale, but they’re all different sizes, because the Gundams in the show were different sizes! 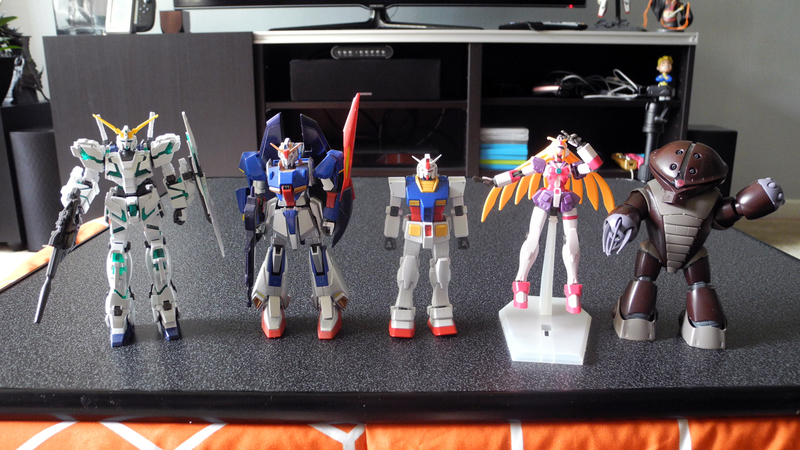 You can tell here that G Gundam mechas were way tinier than Gundam Unicorn ones. It also looks like Gundams have just gotten bigger over time! So to summarize: always look at Gunpla grade before scale. Grade determines difficulty and accuracy (not to mention price!) and you’ll have a miserable time as a beginner if you make your first model a Master Grade or higher. Have you built a Gunpla recently? Be sure to share it with us!